Data Cleaning your family tree program is a must to keep yourself organized. If you do a monthly data clean on your tree, it will help reduce duplication as you proceed. It will also pace your clean up of your older tree, as you work forward. I know that my, FTM2014 and Legacy, still have clean up needs from when I first started putting information into them. I was overwhelmed with the repairs that were needed. Pacing myself makes it manageable. Choosing one type of Data clean at a time. Doing the first five generations with last years Genealogy Challenge from DearMyrtle’s and Thomas MacEntee’s Genealogy Do-Over/Go-Over, helped me learn the importance of starting from my root person, me, and working with my known family members first, moving on to lesser known families members gave me the confidence to pace myself. I will always find new information on my ancestors. I will add that information, to the best of my abilities, into my research excel to-do list with proper citation, links and notes, so that when the time comes to add them to my family tree program of choice, it will be the most accurate. Doing the monthly Data Clean, reminds me of the importance of recording correctly in my To-Do list. It will also limit the number of tree in my database. I should not be adding people to my database until I know their family relationship. I will have the information at my fingertips when needed. Dear Myrtle may not have mentioned this in her getting organized blog, YET, I’m sure she will for whatever family tree program you have. I have down it for my other two programs; FTM2014 and Legacy. I just uploaded my “My Heritage” family tree GEDCOM to my Roots Magic tree. I have been working on this tree, so I felt confident it was fairly accurate in its files. When I did the Data Clean overview, as per the webinar instructions, I found my Place names were not that bad. A good place to start. I decided while waiting for RootsTech 2016 to restart the afternoon Live streaming I would check my RootsMagic program place names for errors. I watch the Cleaning Your Family Tree in RootsMagic webinar #7 previously. I started with the Data Clean drop down menu under tools. I had 53 Place problems. [Sorry no photo.] I corrected the places; mostly were missing United States, had an extra punctuation marks, and the Street Address was not in the description. I did have a few with duplicate county entries (Hillsborough and Merrimack Counties for the same location.) I noted the time period for that record added the current county it is listed by and placed the Historical/Parent County in the description box. 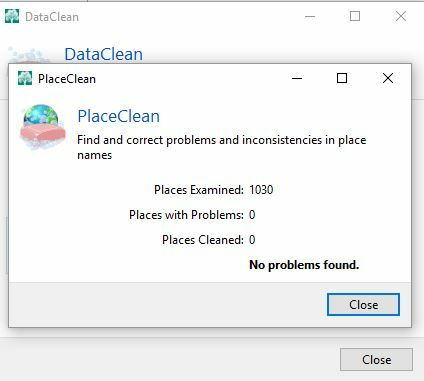 I pressed clean places, closed out when it was done and finally re-did the Data Clean search for places. I did a, Happy Dance, when the screen popped up without problems. Richley-Erickson, Pat “Finally Get Organized,” Dear Myrtle, DearMyrtle’s Genealogy Your Friend In Genealogy since 1995 Blog, 31 Jan 2016. http://blog.dearmyrtle.com/p/finally-get-organized.html: Access 2 Feb 2016, checklists.